We offered this 7- day trek in 2015 and will be doing a longer variation over 9-days in the fall of 2016. 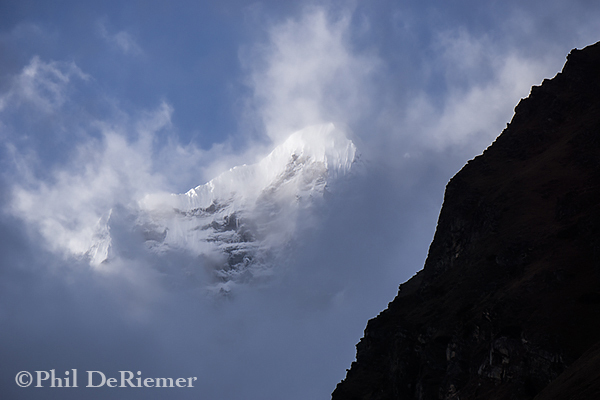 Please view our photos and other blogs on last years Bhutan season here and here. Every now and then it’s just good to get out of the kayak and stretch the legs. 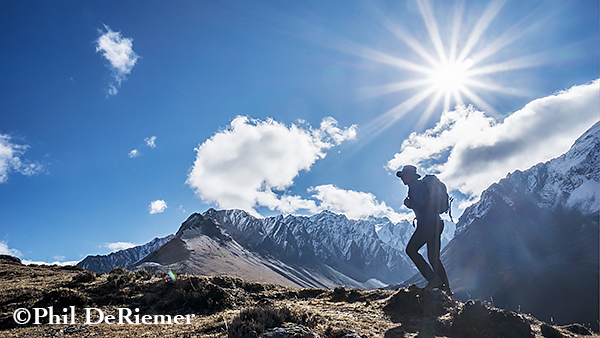 Even better is when that includes a chance to walk among the Himalayan mountains of Bhutan. In the fall of 2015, between guiding our Class III and Class IV+ kayaking trips, I had such a chance. 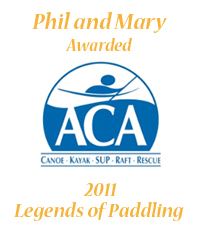 These kayaking trips had been scheduled a week apart to accommodate Mike and Thelma. They wanted to add a trek after the Kayak and Cultural trip so they could see some of the mountains up close. 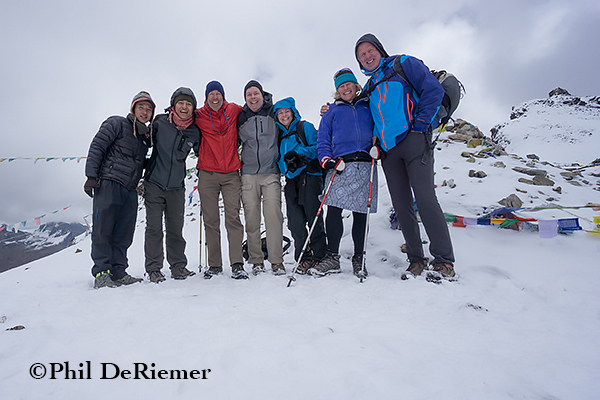 Dirk and Claudia planned their arrival ahead of the Class IV+ group in order to join the trek as well. Our good friend and outfitter Yougs suggested the Jhomolhari trek via Bonte La and Takhung La (both names for passes) to fit our time frame. We would be walking a loop, starting and ending near the ruins of Drugyrl Dzong, the fortress that was once one of Bhutan’s first lines of defense from invaders to the north. 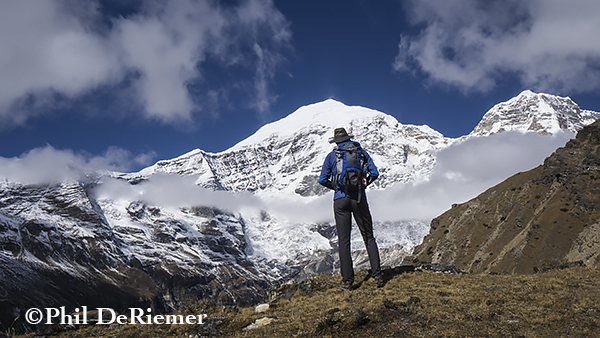 Jhomolhari is Bhutan’s 2nd highest peak at an elevation of 23,989 ft. 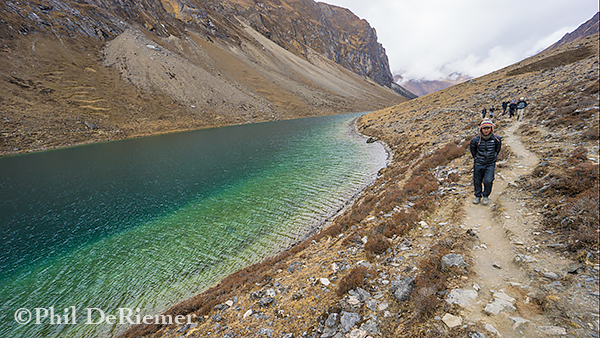 It is also the source for the Paro Chu, a river we paddle on all of our trips. Getting closer to the source of this familiar river would be a treat and a chance to see if any runnable sections lay above the end of the road. We were a group of 5 trekkers with a support staff that nearly tripled our numbers. Karma, our lead guide was assisted by Arnjun. Tashi was our cook. Kencho and Sangay helped Tashi and did the sprint each day from camp to where we would lunch, after packing the previous night’s camp. 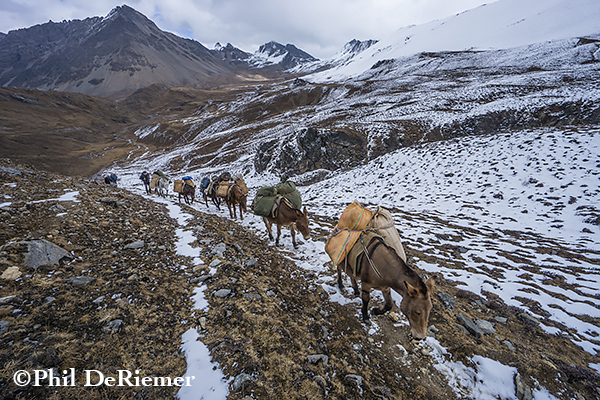 Throw in a string of 14 horses and two horsemen to carry all the camp gear and you have a Bhutanese style trek. Unlike Nepal, where porters are almost exclusively used to move equipment around, Bhutan relies on horses, mules and yaks. Yak herders have long roamed the hills and high pastures of Bhutan’s Himalaya, moving their animals with the change of seasons. Since we were there in late fall, most of the yaks were already at lower elevations. It was raining lightly as we started our trek near Gunitsawa, located not quite at the end of the road that we had taken from the town of Paro. We walked among colorful farm houses with fields of potato, red rice and wheat being harvested. After crossing a small bridge at the town of Sharna we left the road behind and found ourselves in a forest of Oak, Rhododendron and bamboo. This would be our setting for the first day and a half. Camp that first night was nestled in the trees along the banks of the Paro Chu. On day 2 the trail became a bit more technical than the first day. There were numerous rocks that required us to pay close attention so as not to twist an ankle. The trail also gained elevation. Before noon we passed by a junction that, had we gone left would have put us on the old trade route into Tibet, just 8.5 miles away. Our trek for the next few days would be quite close to the border. 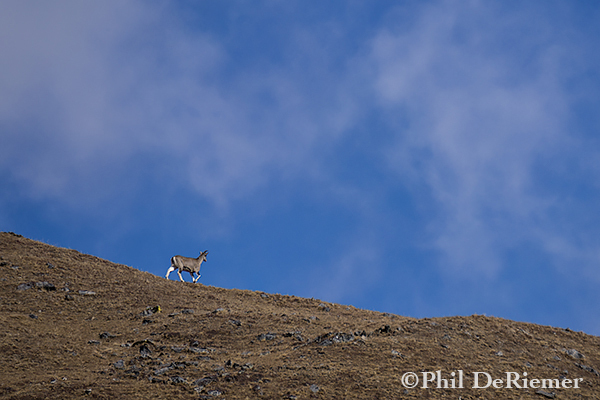 On more than one occasion we encountered other trekking groups on their way down the trail. They gave us reports of poor weather they had experienced and said that the recent snowfall had made a key pass impassable. Karma had us push on. At days end and numerous bridges later we found ourselves at Soi Thangthanka, a developed camp we shared with another, larger group. The weather had clouded over so our opportunity for first views of Jomolhari had to wait until the morning. Day 3 dawned cold and crisp with clear skies. 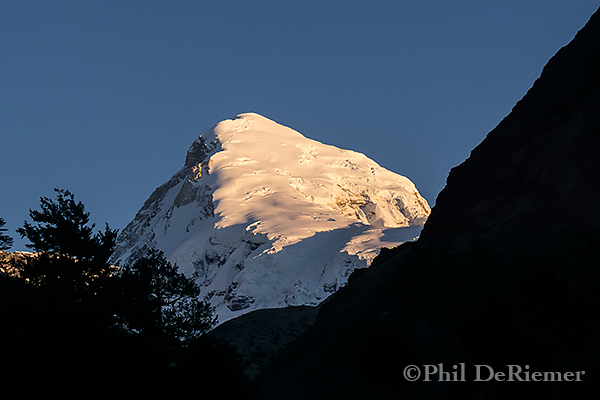 We were treated to alpenglow on the south shoulder of Jhomolhari and looked forward to views of the other mountains we would pass during our walk that day. We broke out of the forest and into the open, continuing to parallel the Paro Chu river. We passed through a military checkpoint that sports a phallus-shaped wind vane – I doubt it’s military issue. Throughout our hike we encountered other trains of horses, much like the ones that accompanied us, that were either supporting other trekking groups on their way out or were returning empty after packing goods into the small villages located along the way. 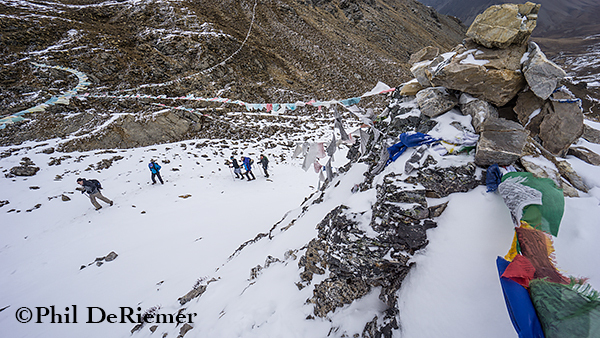 An hour or so from what is known as Jhomolhari Base camp at Jangothang and our third nights camp, the trail passes alongside and through several small villages. It has been a goal of the Bhutanese government to supply electricity to all settlements, regardless of their remoteness. Along our route we saw newly constructed power poles that had been carried in section by section under human power. I tried hefting one of the sections we found along side the trail and couldn’t believe the distances they were being carried. 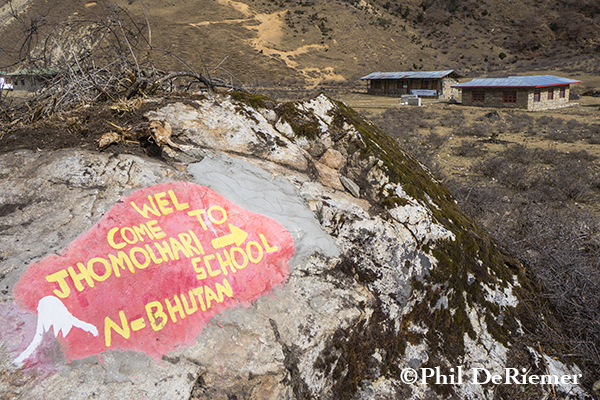 Other strides the Bhutanese government is making to improve life in these remote areas include the construction of better schools and basic health units, such as those we found in the village of Dangochang. Our camp that night was located at 13,382 ft. and we were all feeling a bit winded as we dropped our day packs alongside our already erected tents. 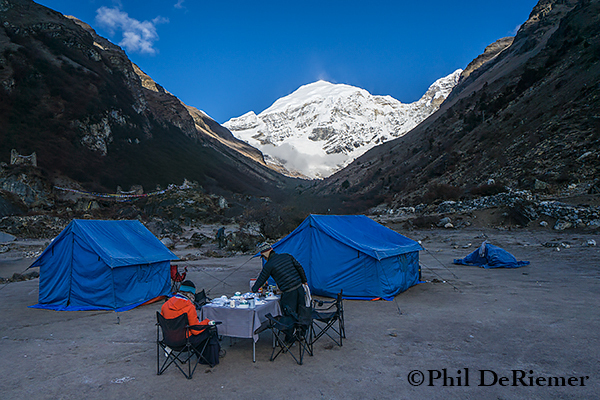 The crew had arrived ahead of us slow moving chillips (foreigners) and greeted us with hot tea and snacks. The clear skies we had experienced at the start of the day had turned to clouds that obscured Jhomolhari’s eastern face, the iconic view from this camp. Again, we would have to wait until morning for clear views. 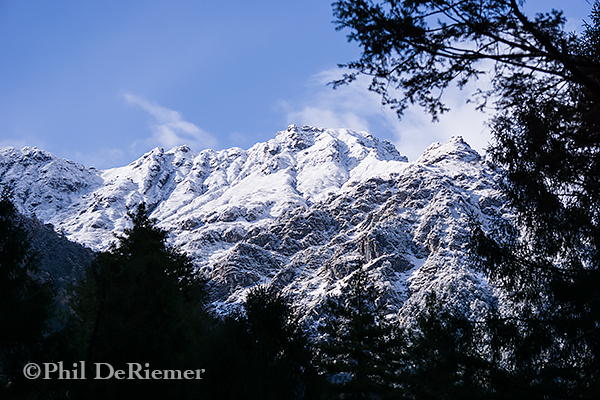 Perhaps it was the anticipation of mountain views or just the altitude, but I was restless and awoke before sunrise. 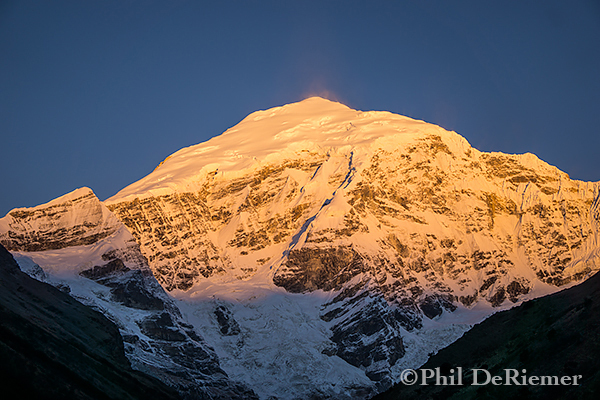 I was treated to a moonlit Jhomolhari that then spread to golden light striking the face of the peak. We took it all in as we sat in the cold and ate our hot breakfast. Today we would be laying over and it was up to us how we spent our time. The goal was to acclimatize and we could do this by resting in camp, hiking to a glacial lake located up valley, or ascending the ridge behind camp that could potentially yield spectacular views of Jhomolhari and surrounding peaks, as well as a chance to see wild Blue Sheep. We chose the ridge. My altimeter read over 15,500 feet when Dirk and I stopped at our high point to look across at the east face of Jhomalhari. We could see that the others had stopped below and were resting. We dropped down to join them and take in the views of the surrounding peaks and the climb up to the hanging valley and lakes we would do tomorrow. During our slow but steady walk up the ridge we did indeed stumble on a small herd of Blue Sheep lounging and grazing as we passed! Day 5 after crossing the Paro Chu for the last time we ascended switchbacks that took us to the hanging valley we saw from our high point the day before. The trail then eased up as we paralleled the lakes to the end of the valley. Just beyond we could make out the trail cutting through the snow. This is the area that had turned back the groups we saw descending on our second day of the trek. It had been three days since we saw them and the weather had been stable. The snow we encountered wasn’t much more than a couple of inches deep and was no problem for us . More importantly, the pack horses could get through. Hiking up many hours with over 2600 ft of elevation gain, we arrived at Bont La, a pass located at 16,039 ft. and our high point for the journey. Despite some scattered clouds, the views throughout the day were spectacular and gave a taste of what it might be on a totally clear day. 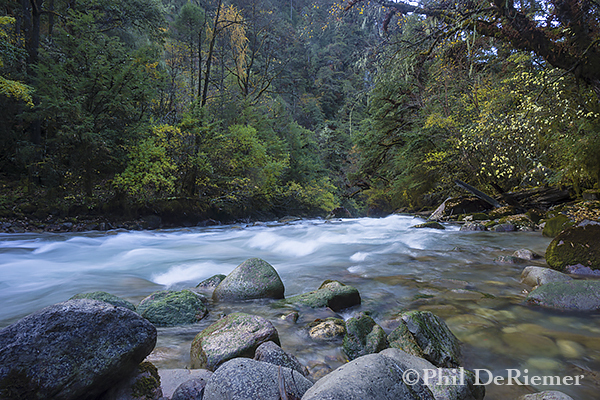 Rugged, massive peaks, valleys, creeks and waterfalls all made up the landscape. Once over the Bonte La we began the descent toward Soi Yaksa. We would loose all the elevation we had gained that morning and then some. We arrived in camp at 12,464 ft. nestled in a clearing surrounded by trees. Another pass awaited us on day 6. We reached Takhung La, 14825 ft. shortly after lunch. 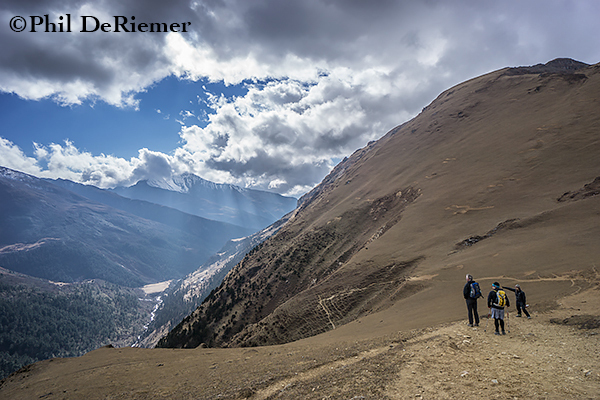 To get there we climbed above tree line and contoured along a long valley running east-west. We then turned south into a side valley, walked toward its end and turned west again to begin ascending. I am told that on a clear day one can see Kangchenjunga, the 3rd highest mountain in the world which straddles the border of Nepal and Sikkim, India west of us. The clouds obscured our view. 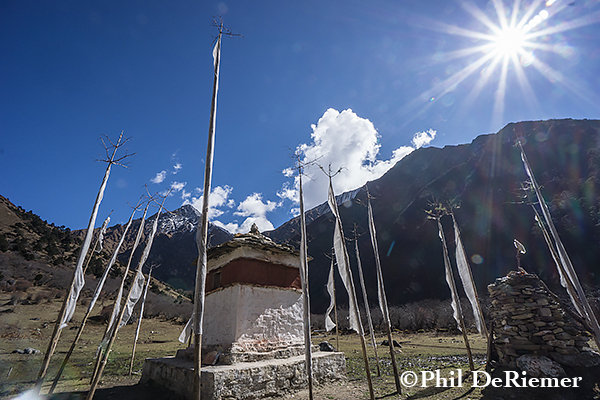 Thombu Shong is a pasture and sometime yak herder camp. Here we spent our 6th and final night of the trek. Our final day we had only 656 ft. of elevation gain to reach our final pass of Thombu La. From there we traversed out along a beautiful ridge from which we began a descent that ate up some serious elevation. 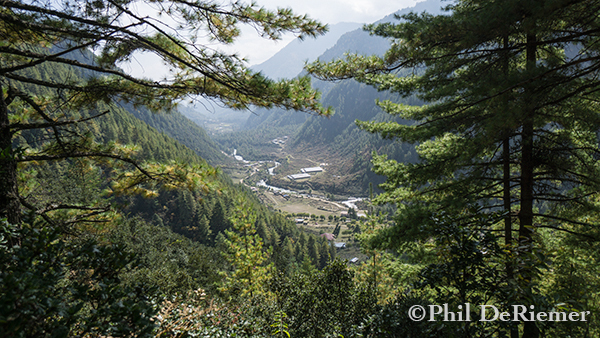 We could see the lush forest of the Paro valley below us. We arrived in time for lunch, tired and full of good times and good memories from a wonderful trip. Many thanks to our Bhutanese staff who treated us like kings and queens. They arose long before we did, and greeted us with a hot cup of tea and a warm smile each morning -delivered to our tent. 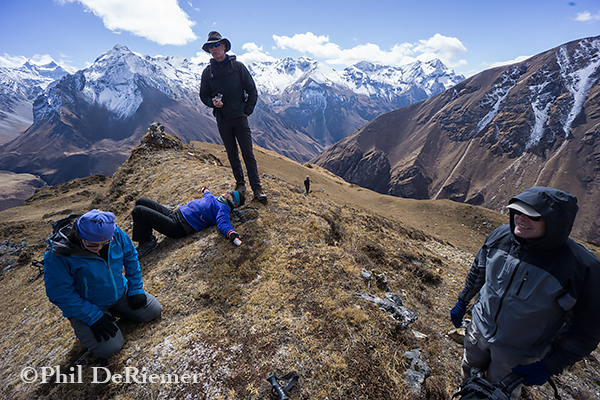 They cooked for us, packed our gear and shared stories of the landscape and their customs. It is the warmth and gracious hospitality of these wonderful people that keeps us coming back. We hope you join us October 27- November 5, 2016.